This a continuation of our series on the top LASIK concerns. In this series, we explain why patients should not be afraid or concerned about getting LASIK eye surgery, a procedure that can provide perfect vision without the use glasses or contacts. Below are numbers 4-6 of the Top 6 LASIK Concerns Answered. During LASIK eye surgery, it is necessary to reshape the cornea. This involves the physician making a thin flap on the surface of the cornea. While some other vision correction services use a blade to make the flap, LASIK is done using a laser that is virtually painless and more precise than a blade. Astigmatism affects many people, and can be difficult to correct with glasses or contacts, especially for those affected with mixed astigmatism. LASIK eye surgery has the ability to correct astigmatism in people with nearsighted (myopia) astigmatism, farsighted (hyperopia) astigmatism, and mixed astigmatism, providing an opportunity for improved vision better than glasses or contacts can provide. Once the LASIK procedure is done, many patients notice a dramatic improvement in vision immediately. Most patients do not experience significant discomfort after surgery and recovery time can be minimal to nonexistent. Patients will be asked to attend follow up examinations to ensure everything is fine. Once it has been determined that the procedure was a success, patients can go on to enjoy having perfect vision. 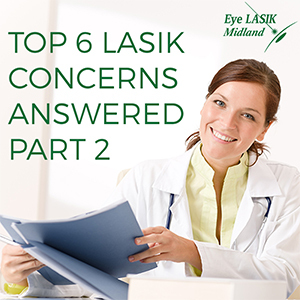 This concludes the Top 6 LASIK Concerns Answered. At Eye LASIK Midland, patients can rest assured that there is nothing to be worried about when considering LASIK for their vision concerns. To talk with one of our referring optometrist or LASIK coordinator to see if you qualify for the procedure, contact us today to schedule a free consultation.